What's the best mix for manufacturing paving units? We have a concrete product manufacturing business including paving slabs, edgings, fence posts, etc. I can't find any exact answers on what mixes should be used including type of cement for best results. The short answer is that there is no set formula for making good concrete for pavior production. It is, largely, a matter or trial and error along with lots of laboratory work. Think about it: just how many variables need to be considered? Does every manufacturer have the same sand? The same coarse aggregate? Is cement the same from country to country? Does water always have the same mineral content and pH values? And that's before we even start to consider additives such as plasticisers or air-entrainers! Further, the type of machinery being used also needs to be factored-in. What sort of mixer is being used and what quantity is being processed in each batch? Then, what sort of moulding or press is used? 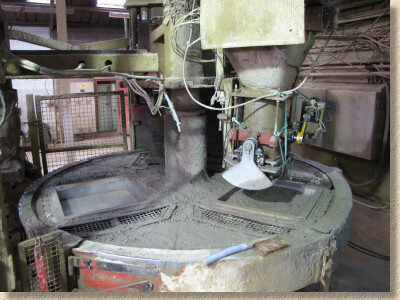 Some moulds need a concrete with a higher slump while others need a low-slump mix. The water:cement ratio will need to be considered. And how are the de-moulded products cured? Is there a dedicated curing chamber with fume or steam? Is it simply a matter of storing them in a shed with a low-output heater? These are just a select few of the umpteen variables that will affect, to a greater or lesser degree, the performance and suitability of any concrete produced. In fact, the whole subjects is so convoluted and complicated that some dedicated souls put themselves through university for four years and then go on to do a Masters' Degree or PhD on just what makes a suitable concrete for any given purpose. Concrete manufacturers than employ these brainy types to work on developing better concrete for their own product range. This will involve assessing the aggregates available and experimenting to find the best mix of whatever is on offer locally. They'll also consider the cement type and its performance weighed against the cost. The local water supply will be critically analysed to check whether it needs purification or, perhaps, the addition of specific chemicals to improve its suitability. When you consider all this, you soon come to realise that developing a good concrete mix is a time-consuming and expensive task. For some small-scale manufacturers, using a 1:2:4 mix will give them a just-about-acceptable concrete but that wouldn't be adequate for the larger, quality manufacturers who need to meet certain performance targets, such as compressive strength and water absorption. For these manufacturers, quality control is critical, and, as already pointed out, good quality control and innovative concrete development is an expensive burden to such businesses, so it should come as no surprise that these manufacturers do not publish the exact recipe they use in their production process. The manufacturers invest considerable sums of money developing specific concretes which deliver optimal quality at an affordable price. Why would they give away, free of charge, the key to their success? So, if you want to know what mix recipe to use for your concrete manufacturing set-up, either buy it in by employing a concrete technologist, possibly as an external consultant, or start doing your own trial-and-error tests. There is no single right answer. Start with a prescribed or designated mix and tweak it from there!